Can I Get a Refund for My Mindvalley Mentoring Subscription? If you sign up for Mindvalley Mentoring, you get 7 risk-free days to test drive all your membership features, connect with other members, and enjoy the perks. 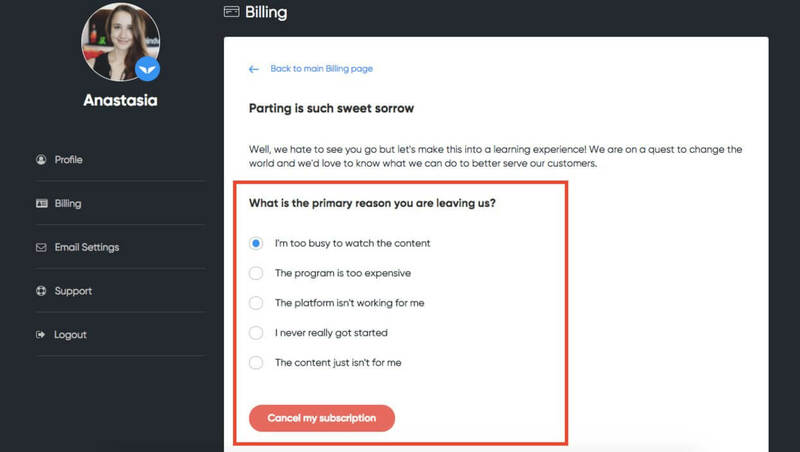 If in this time you’re not really keen on the experience, you can cancel the subscription at any time. After the 7-day trial membership you will be charged the annual subscription fee for Mindvalley Mentoring. You can't get a refund after this point. You can cancel your subscription so you won't be charged the following year. But you will not be refunded for this year. If you signed up on the Google Play Store or Apple Store/iTunes, see this article for details on how to cancel your Trial. If you signed up on the web, In order to cancel your Mentoring plan, you need to access your Mindvalley Account Dashboard. Click the profile icon at the top right corner of the page and select Billing.